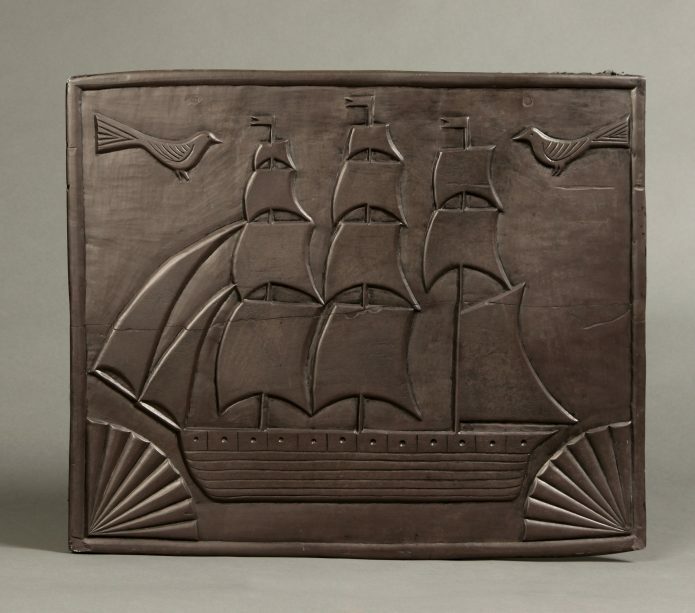 A wonderful and rare carved folk- art slate panel.A confidently carved, single piece of slate depicting a three masted ship in full sail, flanked by two birds and with two sunburst corner spandrels. Items of folkart decorated slate can be found from all parts of the slate quarrying areas of North Wales and include miniature chests of drawers, shoes & doorstops etc. Of particular note are the large carved fire-place surrounds which are found in the Dyffryn Ogwen area of Gwynedd which often depict sailing ships and birds. in the accompanying book by Kenny R, McMillan J, Myrone M,Tate Publishing (2014).